If you are having someone build for you, the most important decision you will make is who will build for you. Finding the right contractor can save you time, money and headaches. Here are a few simple tips to help. Make certain your contractor provides a contract that states an agreed upon amount for a complete finished product. Beware of a so-called contractor that offers an hourly rate. While you think you may be saving money, there is no incentive to complete the work in a timely manner. The contract should provide descriptions of what will be included, may state what is not included, and always gives a fixed price. If you don't know where to find a reputable contractor, try going to a local lumber yard and asking management who they would recommend. Lumber yards routinely work with contractors and most will happily recommend a trustworthy one. Tap into this resource. When you are discussing your project and your needs with a contractor, have them provide references to previous customers. Call these prior customers and ask about their experience with the contractor. Also ask for a tour of their home. Most people love to show off their homes and talk about how happy they are with them (or not). Take time to find a good contractor. 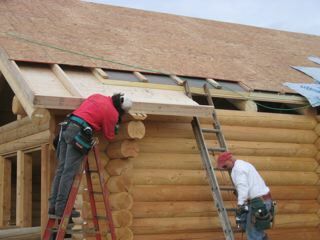 A good contractor sets the tone for your entire log home experience. Contact us if you need additional help finding a good contractor.